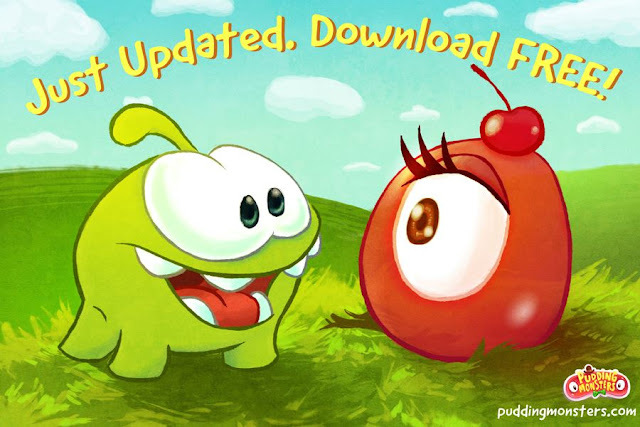 For those iOS users who still haven't bought "Pudding Monsters", you're very lucky if you read this and download the game quickly because it has just been offered FREE for a limited time in the Apple iTunes App Store (for this week only). What's NEW in Version 1.2 ? (1) There's a NEW Episode 5 "Sky View" containing 25 levels like the previous 4 episodes, so the game now has 125 levels. (i) Powerlifter Pudding Monster - when it moves towards some obstacle like "mountain", "cone" or "eye", the obstacle is pushed 1 square away. (ii) Cone - when a pudding monster hits it, only the 1-square body part that hits the "cone" directly is blocked while the other body part(s) (left and/or right, if any) will be split off and continue moving ahead. Now the main menu has a "Hints" button (circled in green) as shown above. When you tap on the "Hints" button in main menu or when you've used up all your "Hints" and you try to use it again in any game level, a menu like the one shown above will appear. The costs are shown in local currency and they may be changed in future. Last time they only gave 1 free use of the old "Mushroom Boost" feature, now I think it should be the same for this new "Hints" feature but this sort of thing may change in future. Below I show you a simple example for Level 5-01. Last time I was left with 4 uses of the old "Mushroom Boost" feature and now in ver. 1.2 it has been converted to 4 uses of the new "Hints" feature. 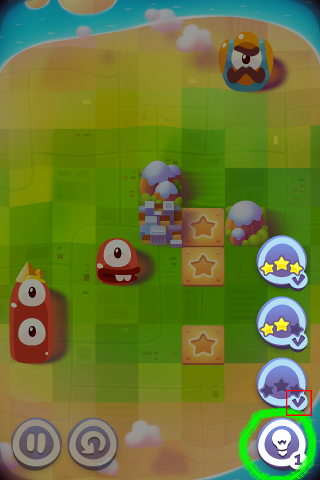 The previous "mushroom" button has been changed to a "lightbulb" button at the bottom-right corner of the gameplay screen, as shown in the above screenshot. When you tap on the "lightbulb" button, a menu appears on top of it (as shown above), listing the full set of solutions needed to earn the "crown" for this level. 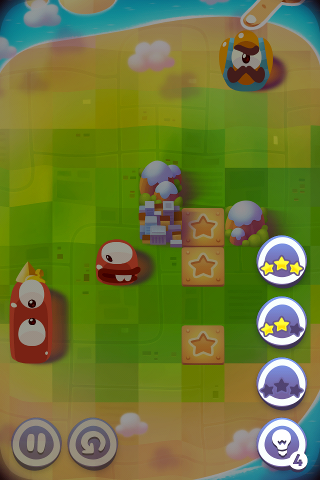 In this case you can see that 0-, 2- and 3-star solutions are needed for the "crown" and all of them have not yet been obtained because there's no "tick" at the bottom-right corner for each of them. Please compare with the screenshot below. 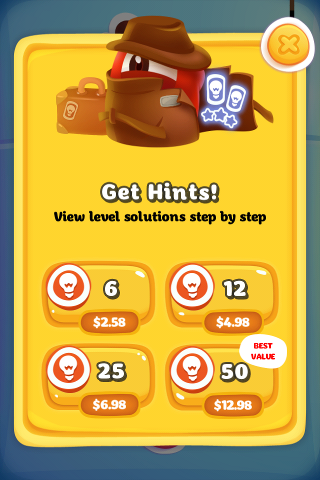 For each 0-, 1-, 2- or 3-star solution that does not have the "tick" (meaning the puzzle hasn't been solved before) and you tap on it (the circular icons in the menu are "buttons" actually), 1 use of the "Hints" feature will be deducted, so after trying out the "Hints" feature for the 3 cases I'm only left with 1 "Hint" now. I've obtained the solutions for all 3 cases so you can see a "tick" beside each of them. 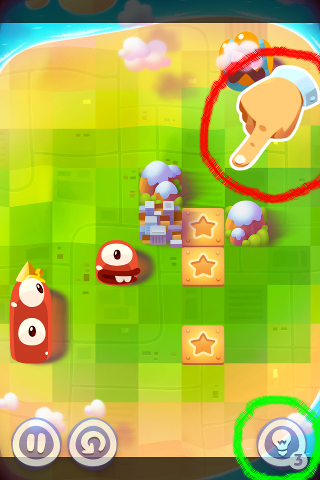 When you use the "Hints" feature (by tapping on a circular button in the menu of the "lightbulb" button), at every step of the solution, a moving hand with a pointed finger (circled in red above) will move about on the screen teaching you how to make every single move. If there's already a "tick" beside the button (meaning that you've obtained the solution before), then you can tap on it any number of times to view ZeptoLab's solution without any worry, because the number of unused "Hints" that you still have won't be deducted. So you can try out this new "Hints" feature for the earlier puzzles which you've solved before (they'll have "ticks" beside them). If you know how to solve all the puzzles, then there's no need for you to buy or even try out the new "Hints" feature. This is just an "optional" in-app-purchase item. I'm busy recently and I just downloaded this new update, so please wait a few days for me to post Part 4 (for Episode 5) of my guide for this game. I also have to replay all the earlier levels to check for changes, etc. and I'll update the earlier parts of the guide a few days later, sorry for the delay. Thanks for the tip. Actually I read the complaints by some Android players also. If you did not know the android version has credits that you use to open the levels and get hints. The screenshots I show above are for the iPhone version, just in case some Android players are wondering. Sorry for posting two comments, did not think the first one was posted.